In her magnificent 2008 study The Civil Contract of Photography, an attempt to synthesize philosophy, theory, politics, the arts, and social history of photography into a new ethical groundwork from which to rigorously rethink the status and claims of photography in a hypermedial world, Ariella Azoulay interprets several examples of (press-) photographs made in Israel and the occupied Palestinian territories in need of becoming “emergency claims.” Azoulay uses the French word énoncé (what is said) to describe the statement (announcement) that can be made through photographs, in order to attest spectators. At best, spectators who aren’t indifferent consumers of photographs, being led by the often misleading captions and contexts in which photographs tend to be framed, but active and critical spectators that deeply question the photographs and what can and cannot be seen in them. To do so, photographs need to be cleared from overt politicization, and it needs to be admitted that photographs are essentially unstable and inconclusive of every meaning that can be read into them. Palestinians living in the territories occupied by Israel, a democratic nation, though in a state of emergency already since its inception in 1948, are not just victims of a disaster confined by temporality (earthquakes, wars, et cet. ), instead they are, in Azoulay’s words, “permanently living on the verge of catastrophe.” The intentional (and unintentional) emergency claims of those victims, without granted citizenship under the ruling powers to which they are subjected, is that they should be treated as citizens. By coming into existence through the means of photography they instantly become a member of the citizenry of photography. In that citizenry a sovereign is not an invisible superpower, but a party to negotiate with in becoming politically equal among equals. “Everyone is equal before the photographic technology,” writes Azoulay. An unwritten yet intuitively felt existence of a civil contract of photography might therefore be an impetus for a true democratization of politics and representation. A promise ever since the French revolution of 1789 and the public release of photographic technology in 1839. Yet, when democracy and the way it is represented is under threat of corporate interests and an increase of authoritative regimes, photography could be “a place of refuge from which the discourse on the res publica may be revived.” In reconsidering concepts like Giorgio Agamben’s homo sacer (bare life), and by re-appropriating Hannah Arendt’s philosophy of action to the theory of photography, Azoulay weaves a socio-political discourse on human rights and photography that is highly idealistic. She should be praised for bringing ideas back into the theoretical and ethical discourse on photography that go beyond a usually too superficial handling of photography’s social and political implications. However, it’s not easy to think of how a civil contract of photography would take effect in reality, where violence and injustices seem more rule than exception. Nonetheless, her arguments are based on a realistic understanding of how photographs are too often negatively exploited by political apparatuses that aim at alienating human beings from each other, leading citizens to regard non-citizens as enemies who should be degraded, abandoned, or even killed for no valid reason. 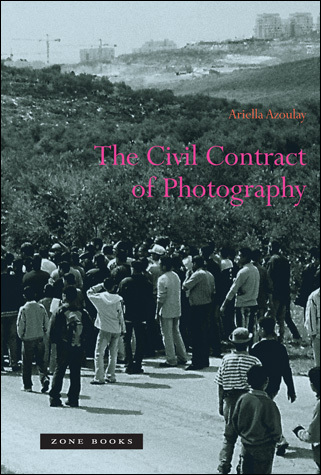 The Civil Contract of Photography and Photography between poetry and politics are thought-provoking studies in which photo-theoretical, ethical, and socio-political issues are being discussed very seriously. Azoulay’s exposé unfortunately is very long (appr. 500 pages), and in some central arguments repetitive, which could be discouraging for potentially interested readers. I sincerely hope that in the near future she will publish a more concise volume with her deeply impressive, and, above all courageous, reading of photographs from “the verges of catastrophe.” For a large part, both publications frame the ethics of photographic and political representations within one of today’s most heavy debated conflicts, namely Israel vs. the Palestinians. After reading essays by Simon Faulkner and T.J. Demos on photographs from the West Bank, or Azoulay’s painstakingly detailed descriptions of the restricted life conditions and inhuman treatments Palestinians have to deal with, an image of Kafka’s penal colony comes to mind, a colony in which its inhabitants are always immediately found guilty. Fighting against injustices by claiming (more) freedom in the uses, appropriations, and interpretations, of photographs is one of the main imperatives these books are able to teach us. Photography does not exclude anybody. Everybody is able to join the citizenry of photography, in which no absolute power exists. Ariella Azoulay, The Civil Contract of Photography, Zone Books, New York 2008. Hilde van Gelder, Helen Westgeest (eds. ), Photography between poetry and politics: The critical position of the photographic medium in contemporary art, Leuven University Press, Leuven 2008.